Malcolm Gladwell has a talent for finding off-beat subjects to write about. He then draws from such diverse sources in his research that his books are always thought-provoking, this collection of essays is no exception. For me the most interesting articles were on the talent myth and open secrets. The talent myth focuses on the concept propagated by McKinsey, and exemplified by Enron, that a successful company should be obsessed with talent acquisition and promotion. The concept is summarised in a quote from an un-named GE executive “Don’t be afraid to promote starts without specifically relevant experience, seemingly over their heads.” It’s a seductive extension of the idea that great leaders are born out of difficulty or struggle. This idea is born out by research in a book I’m currently reading called Leading for a Lifetime by Warren G. Bennis and Robert J. Thomas, who refer to a “crucible” where leaders go through a trial that pushes crystalises their identity as leaders. In the company I work in there is talk of “stretch assignments” designed to give those identified a crucible type experience. But when taken to extremes the result is Enron, where the needs and wants of those people recruited as stars supersede those of customers or any consideration of potential profit. He cites specific examples where Enron employees were able to take businesses in a new direction because they wanted to – and quotes Jeffrey Skilling “If lots of employees are flocking to a new business unit that’s a good sign that the opportunity is a good one…”. It seems breathtakingly stupid now, but perhaps that’s just the benefit of hindsight. The chapter on open secrets looks again at Enron, pointing out that much of what was later found to be wrong with the company was always public information(pdf) – starting with the discrepancy between the theoretical profits earned vs the filings with the tax department. 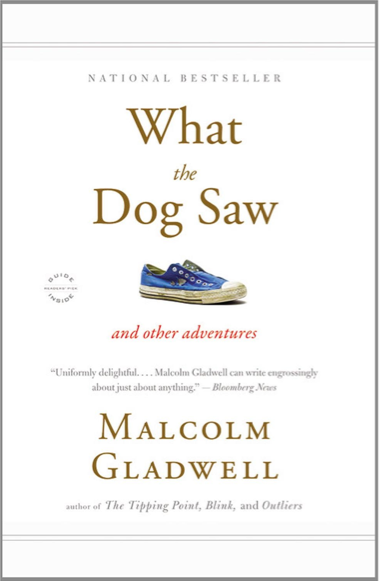 Gladwell’s point here is that it’s often not a lack of information that hampers our understanding of a complex situation, it’s the volume of information and the high “noise to signal ratio” of the information. It has applications to today’s financial crisis, and to the “war” on terrorism. If the intelligence community receives a tip off and does not act it can seem as though they’re not doing their job when something does go wrong. The problem isn’t receiving the information the problem is filtering and analysing the information to decide which tip-off is credible and relates to a real threat. It’s the modern day equivalent of a needle in a haystack, and it goes some way to explain why Abdulmutallab (The Christmas Bomber) was able to get a visa to the US and travel there despite a credible warning from his father. He also takes a hard look at the sales pitch, hair dye and dog psychology. In each essay he combines analysis and anecdote to give the reader a great picture of his argument along with some evidence to back it up. The hair dye story pits the marketing of Clairol (“does she or doesn’t she”) vs L’Oreal (“because you’re worth it”) and interweaves it with the development of feminism and a growth in confidence in women. It’s a fun and interesting read. Bram your link is the “Open Secrets” article, it’s interesting. Years ago someone from Enron came to a recruiting day when I was at university. Some of my class were quite “buzzy” and excited about the presentation, others of us were uncomfortable with his credibility and the picture painted but couldn’t really state why.